Cured salmon, often referred to as gravlax, is the perfect do ahead hors d’oeuvres for the long New Year’s weekend. Cured salmon will keep happily in your refrigerator for more than a week. Right now Christina and I are not sure of our plans — except for New Year’s Eve when we celebrate the anniversary of our engagement with a dinner for two at home. But I made a large batch of roasted sweet and hot peppers last week — I added more sweet this weekend as I had too many hot — and Sunday I began a citrus-cure of two pounds of salmon. I’ll make some crostini tonight and know that I have two at-the-ready hors d’oeuvres for welcoming guests…whenever they appear. 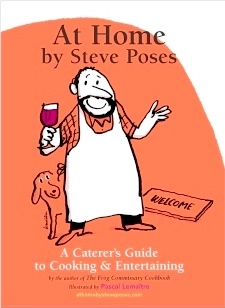 The following recipe is from At Home by Steve Poses: A Caterer’s Guide to Cooking & Entertaining. The recipe suggests a two to three day cure, but you can make a lovely and light cured salmon with a twenty-four hour cure. The length of the cure is also dependent on the thickness of your filet with a thin filet requiring a shorter cure. My filets were fairly thin and the salmon was perfectly cured after twenty-four hours though a longer cured would have intensified the flavor and produced a somewhat drier outcome — not better, just different. Cured salmon is a versatile meal starter. Once you get comfortable with the simple process of curing salmon, you’ll be able to create your own variations. The basic cure mixture always includes sugar and salt: The salt draws out moisture and breaks down the natural protein, while the sugar provides sweetness. The recipe below uses only the basic mix, but you always want to add an accent; you can find these in the variations described below. Salmon has a high fat content that results in a firm and pleasant texture, but tuna also takes cures well. Buy very fresh fish. Avoid the narrow tail end of the salmon, as it will easily dry out and resist slicing. Thicker portions are preferred though they will need more time to be cured. do ahead Cured salmon can be made well ahead. You can start up to three days in advance for lightly cured salmon or up to two weeks for long-cured salmon. Store cured salmon, tightly wrapped in plastic, in the refrigerator. 1 Remove skin and trim away fat on the skin side of the salmon. Trim off the thin striated strip that runs down one side of the filet so the piece of fish is uniform. Run your finger along the top flesh, about an inch from the thick side, checking for pin bones. Remove any pin bones with tweezers or needle-nose pliers. Rinse filet and pat dry. 2 Make the basic cure by combining salt, sugar, pepper and additional flavor accent. Use a fork to distribute ingredients evenly. 3 Spread a generous piece of plastic wrap large enough to easily wrap around the fish. Spread a layer of the cure mixture in the shape of the filet. If you have cheesecloth on hand, lay that down next. The cheesecloth will make it easier to remove the curing mix. Place fish on top and add enough cure mixture to completely cover, with some cure mixture spreading over the sides of the fish. 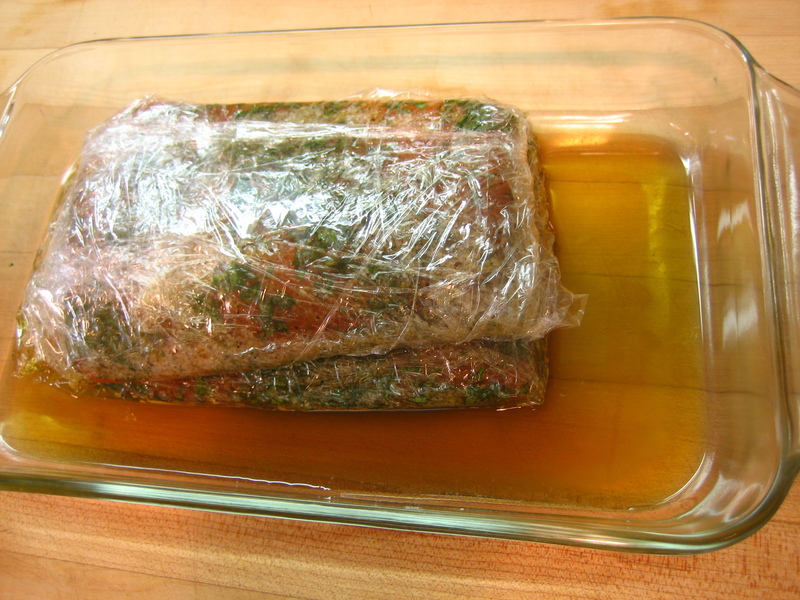 Tightly wrap the fish in the cheesecloth, if using. Either way, wrap again in a second layer of plastic. Place wrapped fish in a shallow, nonreactive container with at least some slope to contain any moisture that escapes from the plastic wrap. Next, place a weight on the fish to aid the extraction of moisture. A plate and several large cans work well. Refrigerate anywhere from 3-14 days. The longer the cure, the firmer, drier and more intensely flavored the fish. 5 Use a very sharp knife to slice salmon on the bias against the grain. For lightly cured salmon, cut slices about 1⁄4-inch thick. For longer-curedM salmon, cut thinner slices. Cured salmon can be eaten without adornment, dressed with a touch of good olive oil or served with condiments on fresh or crisp toasted bread. Pepper-Cured Salmon Add 1 tablespoon coarsely ground black peppercorns, 1 tablespoon coarsely ground green peppercorns and 11⁄2 tablespoons pink peppercorns to basic salt and sugar mixture. Leave some residual pepper and do not rinse. Just scrape. 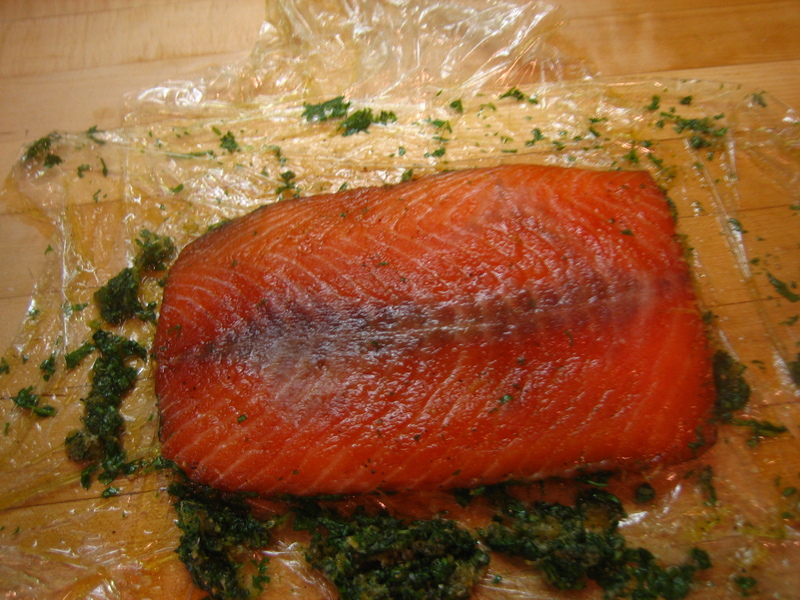 Coriander-Cured Salmon Add 2 tablespoons ground (preferably toasted) coriander to basic salt and sugar mixture. Just scrape and leave some residual coriander. Salmon “Jerky” Add 2 teaspoons ground (preferably toasted) coriander, 2 teaspoons ground (preferably toasted) fennel to basic salt and sugar mixture and use 3 tablespoons total black peppercorns. Use 1 pound salmon trimmings in place of filet. Cure for 5 days. Remove mixture, rinse and dry well. Slice thinly. Juniper and Sage-Cured Salmon Add 1⁄4 cup crushed and chopped juniper berries, 1⁄3 cup chopped fresh sage to basic salt and sugar mixture. Serve with horseradish sauce (see page 216). 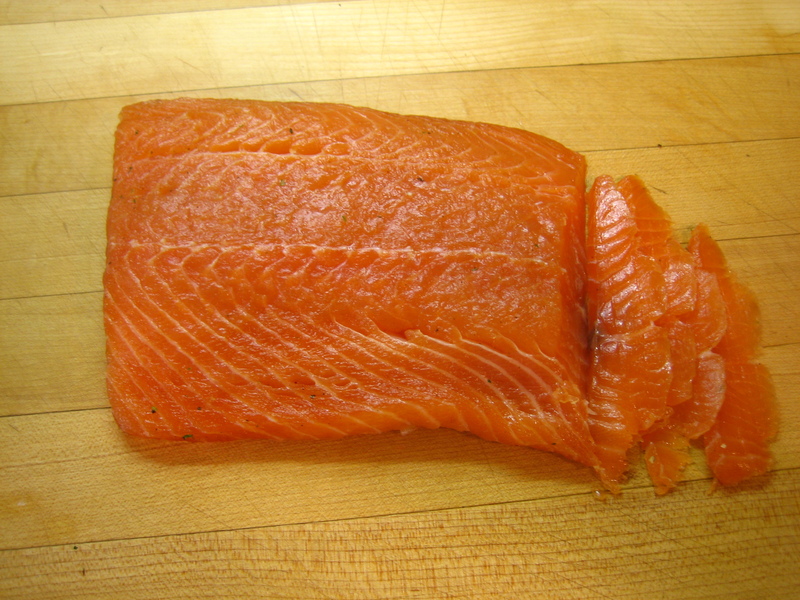 Traditional Dill-Cured Salmon Add 1⁄2 cup chopped fresh dill and 1 ounce brandy to basic salt and sugar mixture. Serve with dill honey mustard sauce (see page 223). Citrus-Cured Salmon with Jicama Relish Add finely grated zest of 3 lemons, 3 limes and 2 oranges and 1⁄2 cup chopped fresh cilantro to basic salt and sugar mixture, using a fork to break up zest. Serve with jicama relish (see page 212). 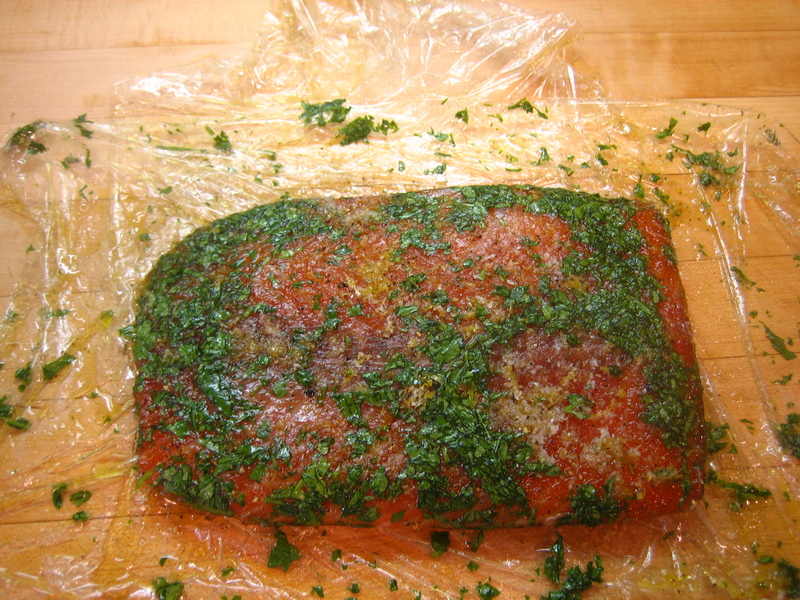 Wrapped and curing salmon filet after about twenty-four hours. With natural moisture of salmon removed by the action of the salt gathered at the base of the dish. Unwrapped filet ready to scrape and rinse. Scrape away crust of salt, sugar, cilantro and citrus zest, rinse and dry. Citrus-cured salmon sliced and ready to go. Add crostini or sliced bread and a dip and you have an easy, every-ready and elegant hors d’oeuvres. It was not quite over the river and through the woods, but a trip up 95 and 287 brought Christina and I to Larry and Susan’s for our traditional Christmas Eve and Christmas Day family gathering. As previously noted, Larry is an an ambitious and excellent cook. Shortly after arrival, with Pomegranate-Lemon Martini from At Home in hand, we began our Seven Fish repast gathered in the kitchen. 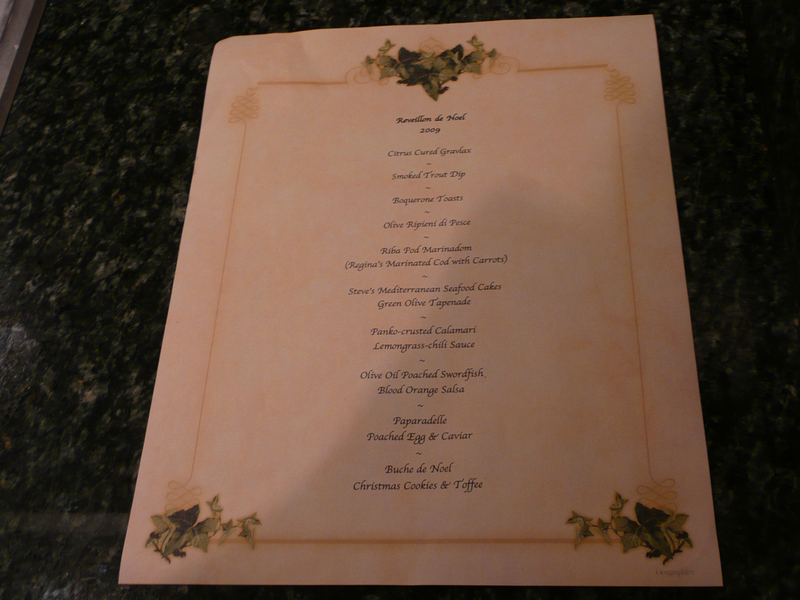 Larry always produces a printed menu that both lets guests know what’s ahead and provides a memento of the evening. Four hours later, happy, sated and a bit exhausted — everything was delicious with the unquestioned best of show being the Swordfish and the Paparadelle. 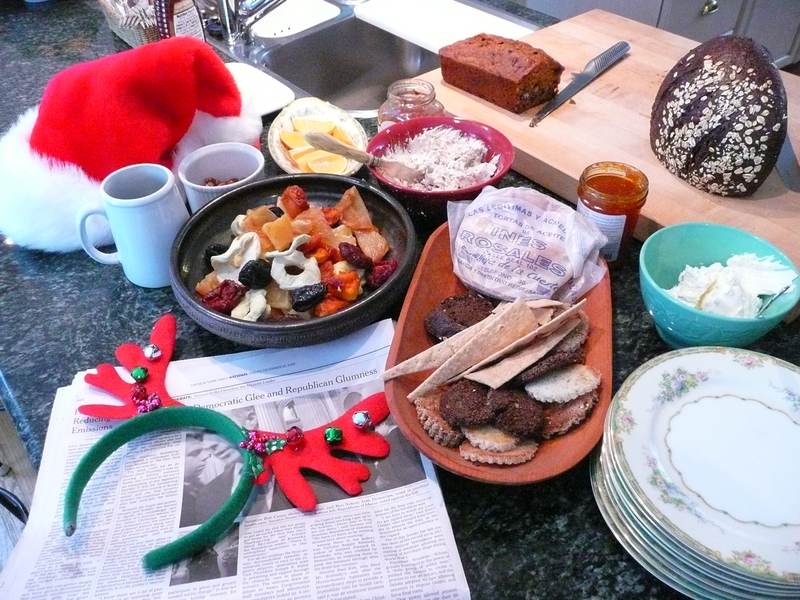 Christmas morning was a noshers delight with some evidence of middle-of-the-night visitors. 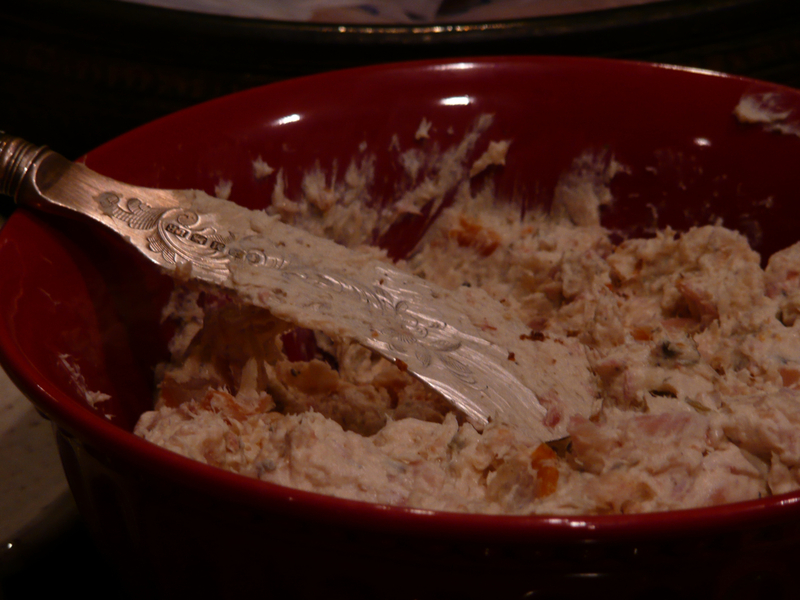 Susan’s pumpkin bread spread with cream cheese and the left-over smoked trout dip were the highlights. Followed by a wonderful Christmas dinner. 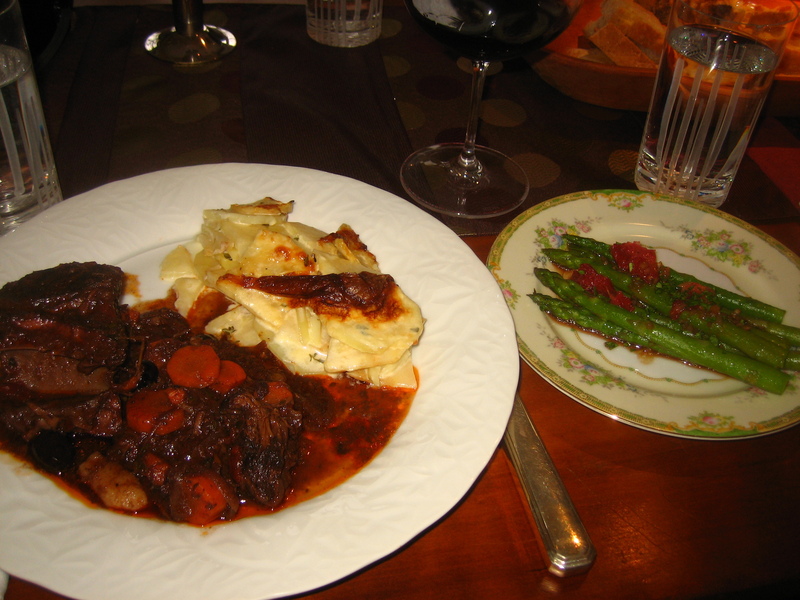 Wine-braised hanger steak and short ribs of beef with a gratin of celery root and potatoes and asparagus with blood oranges. 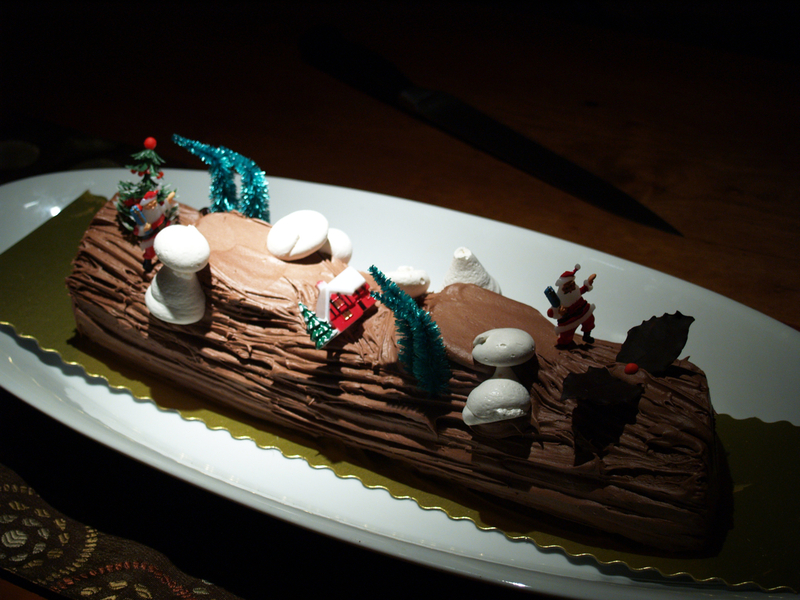 For dessert, Buche de Noel and Christmas Cookies and Toffee Redux. While the food was memorable, most important was the traditional gathering of family and friends and the ritual of food that surrounds that gathering. Dessert wines are sorely under appreciated. Read the following note from At Home and then see some suggestions below. They may not be very popular, but I’ve never known anyone who tasted a high quality sweet wine for the first time who wasn’t delighted and amazed. Sweet wines range in price from relatively inexpensive to extraordinarily expensive, and pairing them with food is not a simple business. With few exceptions, sweet wines are dessert wines. The pinnacle of these are Sauternes from Bordeaux and lateharvest German wines. California also produces some sweet wines of distinction. They’re generally produced from grapes that have been allowed to stay on the vine beyond a typical harvest time. The term late harvest refers to this sweet process. In sweet wine–producing regions, a fungus that occurs naturally in the soil attacks the wine grapes. The fungus effectively punctures the skin of the grape and allows some evaporation of water and concentration of the natural sugars in the grape prior to picking. This lets the winemaker ferment the wine and produce the desired level of alcohol while maintaining a natural sweetness. The high-quality product contains extraordinary depth and complexity, with a honeyed sweetness that’s not cloying. These wines are the true nectar of the gods. The following wines should be available in Pennsylvania State Store. If not available, try to find something similar at about the prices indicated. If possible, seek the advice of a store employee. Typically you drink small portions of dessert wine so a 375 ml or half bottle will provide enough wine for 4-6 servings. These next two are premium French sauternes — extravagant, but worth it. I will spend more time in the new year talking about sake. But, if the only sake you know is none or not much, there is an entire new beverage world waiting for you or your gift recipient. Sake is actually brewed like beer – though other than technique there is no flavor similarity. Made from rice and served chilled, fine sake is more like fine white wine with much of the flavor notes found in wines. In Pennsylvania we have a very limited supply, but there are a few good bottles. Expect to pay at least $25 for a good sake and much more for great sake. Worth it. Sparkling wine is to gift giving as the black dress is to cocktail dresses – not original, but always appropriate. If you are going to bother giving sparkling wine, give something a notch or two up from what you would buy for yourself. You can’t go wrong with a Veuve Cliquot – a French champagne with the iconographic orange label. ($59.95) For an American selection think about a Schramsberg Brut Rose ($39.95). Schramsberg is the classic American vintner of sparkling wine. You don’t need a green thumb to plant and nurture a successful herb garden. Giving the promise to plant an herb garden come Spring – in containers or a sunny spot in a backyard — is a very special gift and one of those proverbial gifts that keep on giving. The following is a note from At Home. Here’s a list of herbs for a nice but not exotic herb garden. Basil (Thai if you can find it). Thyme, preferably lemon thyme. Sage. Cilantro. Fennel, preferably bronze for the color. Chervil (though this is very heat sensitive and doesn’t do well in the height of summer). Lemon verbena. Rosemary. Several varieties of mint. It’s also fun to add a Thai pepper plant. Since parsley and dill are plentiful and pretty inexpensive in the supermarket, I usually don’t plant them. Also, I don’t think of dill as a summer herb, but one associated with cuisines of colder climates. Get the herbs in as early as you can. Herbs like sun, but don’t require it all day. If you get more than you can use for your normal cooking, add them to a salad. The ultimate herbal extravagance is an all herb salad with just a bit of olive oil, a touch of lemon juice and good salt and pepper. 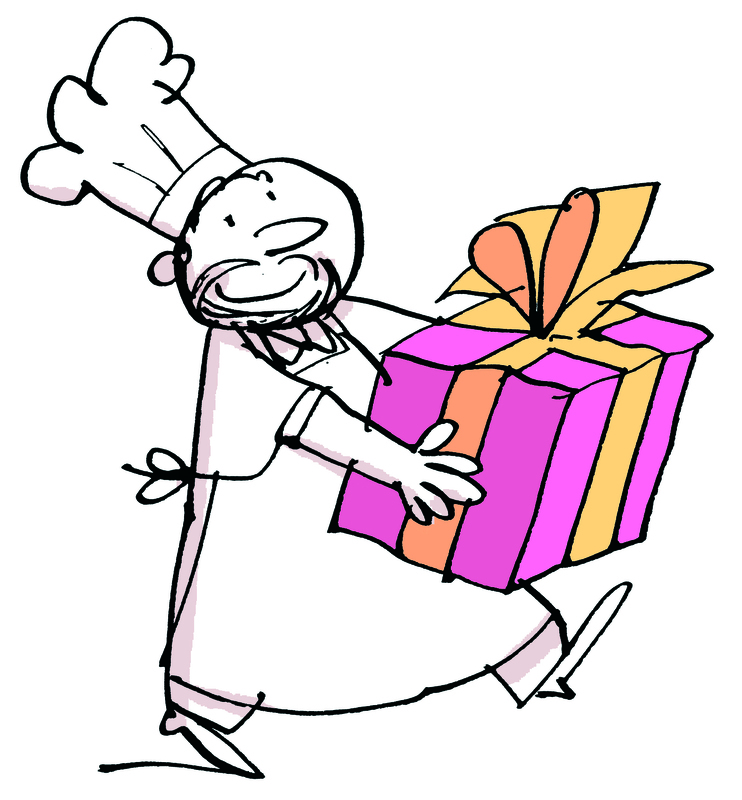 Here are links to previous blogs about gift suggestions. 2. Stay out of the kitchen unless helping or invited. It’s great that you are hosting a holiday celebration. Whatever you do is good enough. Do not fret. Relax. Ask for help. Enjoy yourself. I want to thank you for the support you have provided since the mid-October launch of At Home. It is a wonderful feeling to know At Home is already helping hosts and that over the next several days lots of people will be receiving At Home as a holiday gift. I am confident they will enjoy At Home for many holidays to come. It has also provided me with great joy to have spent many an hour sitting in the amazing Reading Terminal Market “hawking” At Home. More people than I could count shared with me their appreciation of their tattered and worn Frog Commissary Cookbooks — seemingly everyone’s favorite cookbook — and their their own joy over many years dining at Frog, The Commissary and my other restaurants. It has made for a Merry Christmas for me. 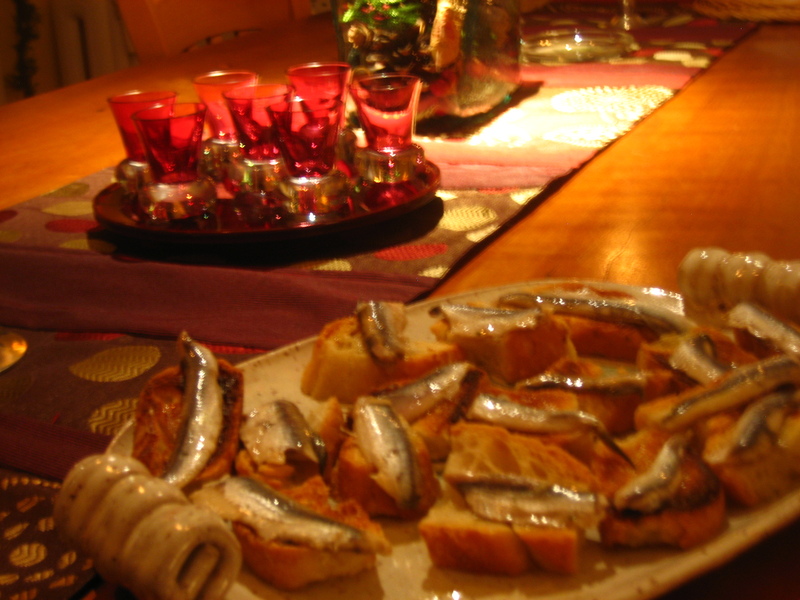 Christina and I are off to brother-in-law Larry and Susan’s in Tuxedo, NY, for a Seven Fishes Christmas Eve (including my Mediterranean Seafood Cakes with Green Olive Tapenade) followed by what I am sure will be a wonderful Christmas day meal. Larry and Susan are wonderful hosts and though I am sure the food will be delicious, what is most important by far, is that family is gathering to celebrate. Whatever your Christmas tradition, my wishes for many delicious moments…at home. There are all sorts of approaches to eggnog, but our favorite is to make a custard base, add some spice and bourbon, brandy or rum, and enrich with some whipped cream. It’s thick but delightfully drinkable. Serve very cold. do ahead Eggnog can be made up to four days ahead, but add whipped cream no more than a few hours before serving. Stir as needed. 1 In a large mixing bowl, combine egg yolks and sugar and beat until mixture thickens and turns pale yellow. 2 Add milk to a 4-quart pot and over moderately high heat, scald milk to just below boiling. Working very gradually at first, add milk to egg-sugar mixture, whisking constantly. Once you’ve added about a third of the milk, you can add the rest more quickly. 3 Return mixture to pot over low heat and cook, constantly stirring, until mixture thickens and coats the back of a spoon. If you’re using a thermometer, shoot for a temperature of 170°. Remove from heat, and immediately transfer mixture back to the mixing bowl. Add 1 cup heavy cream, vanilla, bourbon and nutmeg and mix well. Allow to cool and transfer to refrigerator. Chill for at least 6 hours. 4 Just prior to serving, whip 2 cups heavy cream until soft peaks form and fold into custard mixture. Transfer eggnog to a pitcher. Divide between glasses and serve with a cinnamon stick and some grated nutmeg on top. I will be signing At Home at Reading Terminal Market today (Wednesay) from about 11 AM. Look for me in Center Court across from Meze. Books are also available at Coopermarket at 302 Levering Mill Road in Bala Cynwyd and at Joseph Fox Bookshop at 1724 Sansom Street. Please pass this post along to any friends and family responsible for the eggnog at the Christmas celebration. Among the joys of Christmas is eggnog and there is nothing like homemade. 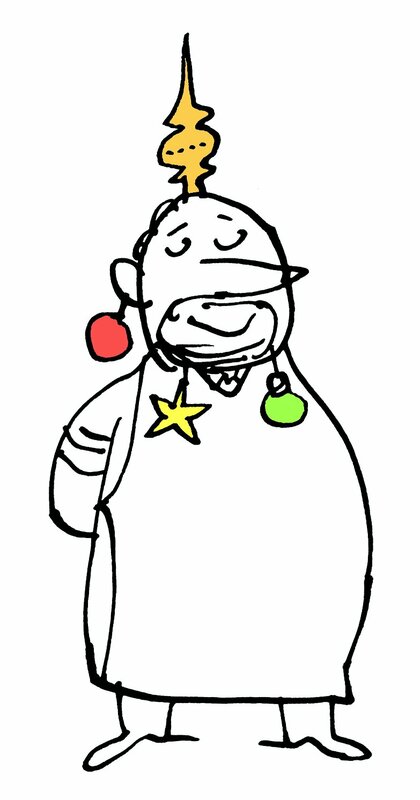 I learned to make eggnog from the legendary Peter von Starck nearly 40 years ago as a cook at his La Panetiere restaurant. 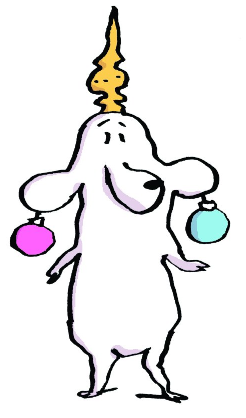 For a Jewish kid from Yonkers, Peter was an epiphany — as was his eggnog. Peter, an extravagant personality, took no culinary shortcuts. And for a once a year treat for guests, you should not take shortcuts either. So, here’s my recipe for Traditional Eggnog — an homage to Peter — from At Home by Steve Poses: A Caterer’s Guide to Cooking & Entertaining. Don’t be intimidated by making the custard base. 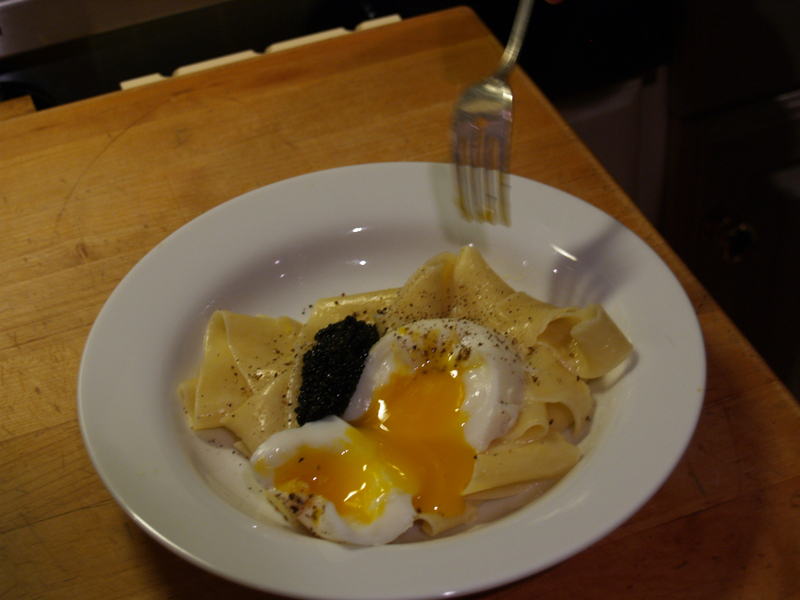 Just keep the heat low and the custard moving to avoid scrambling your eggs. If your eggs do scramble slightly, pass custard through a fine strainer and it will be fine. Bourbon is my favorite alcoholic accent but feel free to substitute brandy or rum — and don’t skimp on the quantity of alcohol. Note: For last minute shoppers, I will be signing books in Reading Terminal Market’s Center Court on Tuesday, December 22nd and Wednesday, December 23rd beginning at 11 AM. Books are available at Coopermarket in Bala Cynwyd and Joseph Fox Bookshop in Center City. Please pass this along to any harried last minute shoppers you know as I’m sure all your shopping is completed. 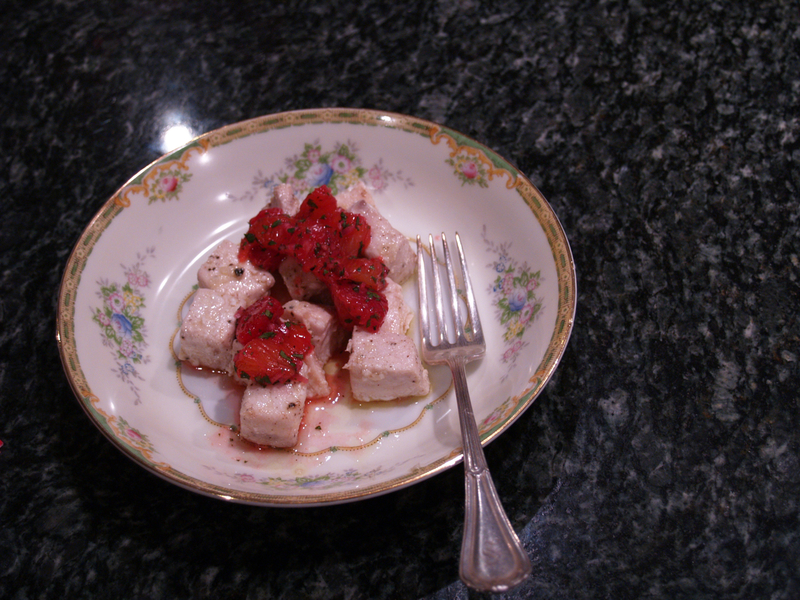 My Christmas Eve assignment from my brother-in-law Larry: something with seafood. I married into the tradition of a family Christmas at Larry and Susan’s. 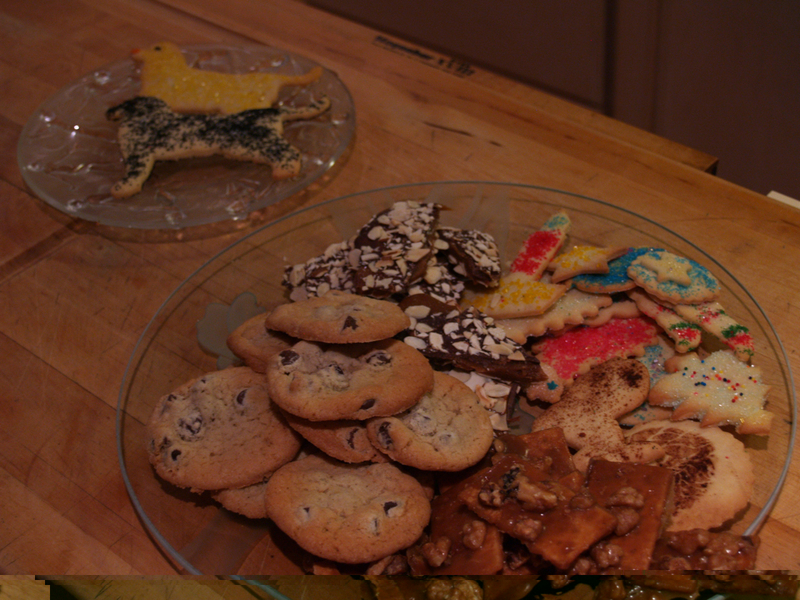 And a tradition that centers around food at night and gift exchange in the morning was a welcome addition to my life. 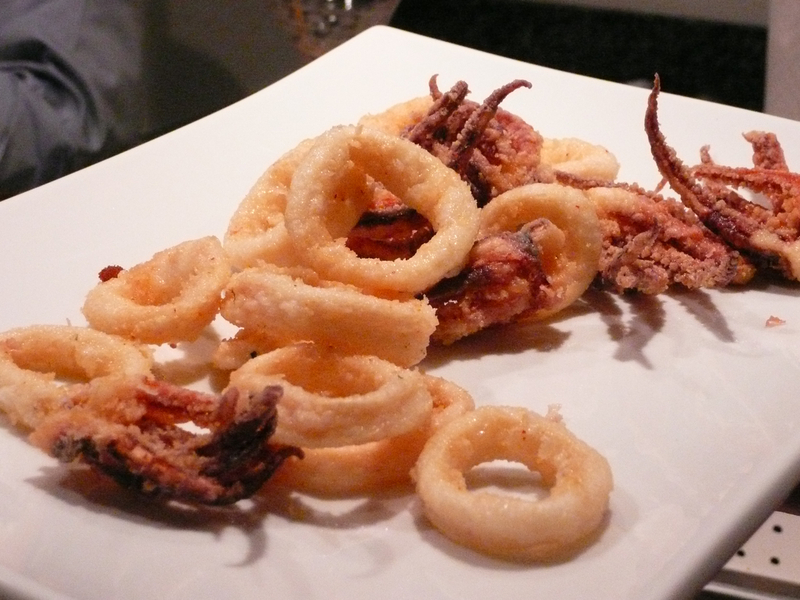 Larry is an excellent cook who handles the seven fishes with gustatory enthusiasm and finesse. Guests get assignments, but the heavy lifting is done by Larry. As Larry and Susan live some two hours away in Tuxedo, NY and as we plan to arrive just as the first bottle of sparkling wine is popped, my plan needs to be very do ahead with a minimum of last minute preparation. These simple to prepare seafood cakes are made from shrimp and scallops with an accent of fennel and sundried tomatoes. They can be made fully ahead and reheated. Don’t be put off by the list of ingredients — it’s mostly shopping with a little chopping. The final coating of a little flour gets a flavor boost from the addition of ground toasted fennel seed, but this is totally optional. The do ahead green olive tapenade adds a piquant bite. You can make miniature versions and serve as an hors d’oeuvres for a crowd. The green olive tapenade also makes for an excellent sitting around hors d’ouvres — a change from the more typical black olive tapenade. Reheating takes just ten minutes in the oven. In the work bowl of a food processor, combine garlic, parsley, olives, anchovies, capers and pepper and process until finely chopped. Add olive oil and process until smooth. Do ahead Cakes may be made up to three days ahead and reheated in 350 degree oven for 10-12 minutes. 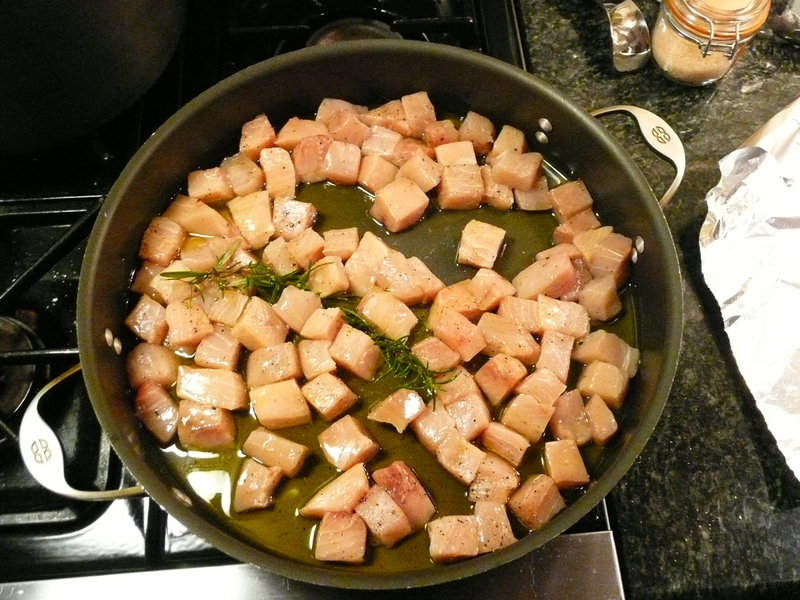 1 Add 2 tablespoons olive oil to medium sauté pan over low heat. Heat oil. Add fennel, onion and garlic and cook about 5 minutes until translucent. Add sundried tomato and dry vermouth and cook until there is just a small residue of liquid. Off heat. Set aside and allow to cool. 2 Add shrimp and 1/4 pound scallops to work bowl of food processor. Pulse into paste. Transfer to medium mixing bowl. 3 Cut remaining scallops into small cubes. Cubes should be between an eighth and quarter inch. 4 Add to mixing bowl cubed scallops, sautéed vegetables, basil, parsley, fennel fronds, egg, 1 teaspoon salt and 1/8 teaspoon pepper. 6 Making cakes: Have a small bowl of water to moisten hands making it easier to work with sticky shrimp mixture. You will make 12 cakes. Form ball with 3 ounces mixture. Flatten into cake about 1/2-inch thick by 3-inch diameter. Lay out cakes on rimmed cookie sheet. Chill at least one hour or up to two days. If making hors d’oeuvres, reduce 1 ounce cakes. 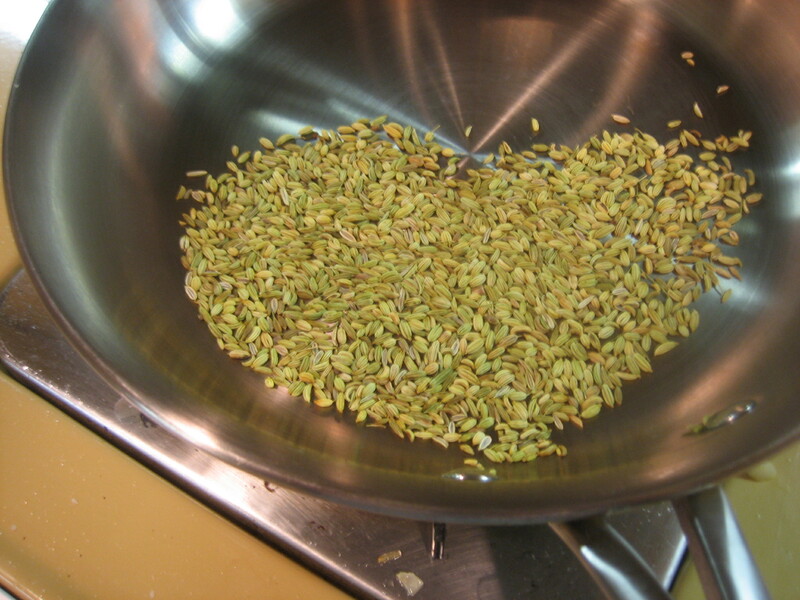 7 Optional: In small dry pan over moderate heat, toast fennel seed until it lightly tans and releases its fragrance. Immediately transfer out of pan to stop cooking. Cool. Transfer to spice grinder and grind until powder. 8 Combine flour, optional ground fennel seed and 1/2 teaspoon salt and 1/4 teaspoon pepper on a dinner plate. Lightly coat seafood cakes all over with flour. 9 Add 2 tablespoons oil to medium sauté pan over low-moderate heat. When oil is hot, add cakes and cook until first side is well-browned, about 2-3 minutes. Flip and continue cooking until second side is browned, another 2 minutes. Don’t cook over too high a heat or outside will brown before inside gets cooked. Continue until all cakes are cooked, adding more oil as needed. do ahead Tapenade can be made up to a week ahead and stored, covered, in the refrigerator. Bring to room temperature before serving. 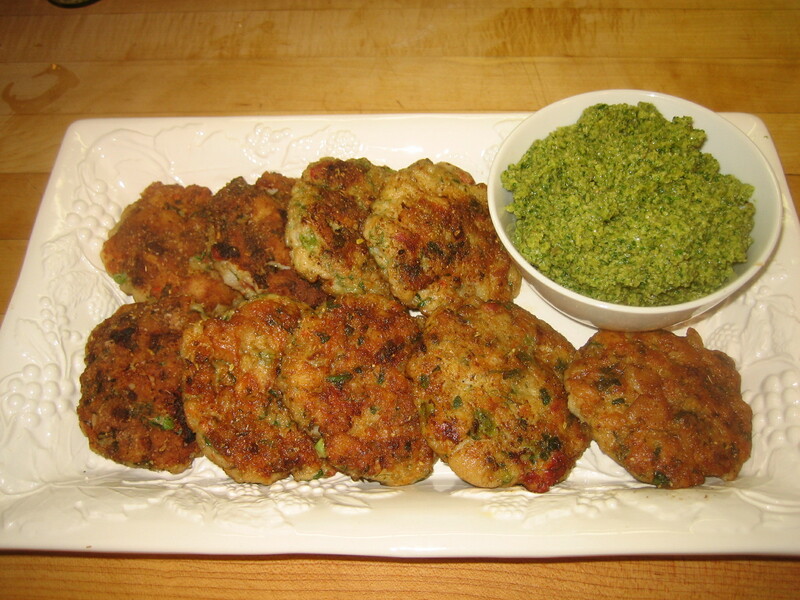 Serve tapenade on the side, family-style or top seafood cakes. 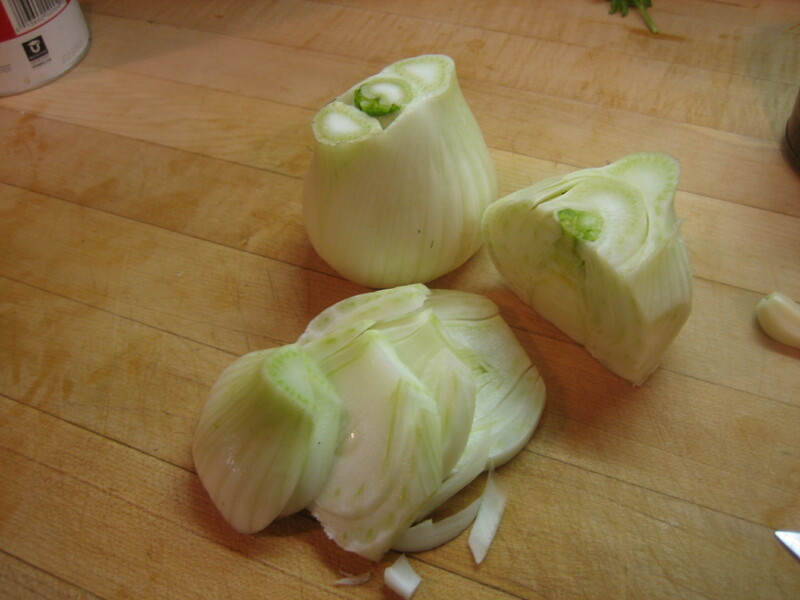 To dice fennel, start by cutting into slices and dice the slices. 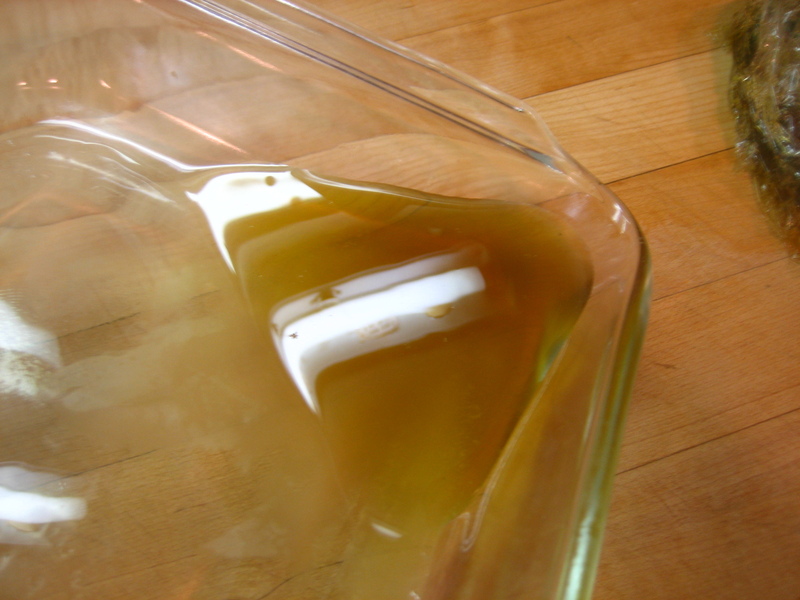 You want a thin layer of liquid left in pan to add flavor to cakes. Dry toasting optional fennel seed. From here it goes into a spice (coffee) grinder. 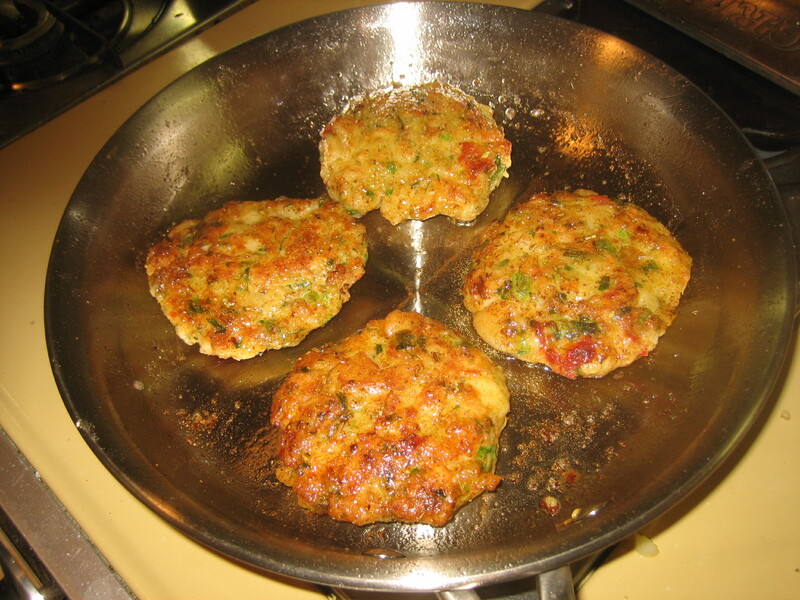 Cooking seafood cakes in batches. Add oil as needed. 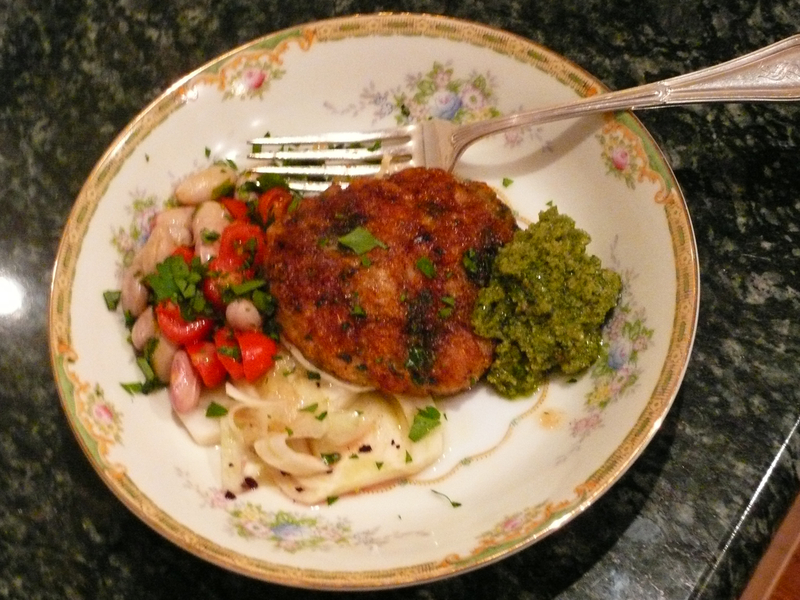 The finished result: Mediterranean Seafood Cakes with Green Olive Tapenade. You too can do this with crowd-pleasing results. I love the combination of sweet and hot — a common Asian flavor profile, but less so in Western cooking. Start by selecting a mix of mostly sweet with a few hot peppers added for interest and surprise. If you have a total of seven peppers, no more than two should be hot. None of the peppers pictured below are very hot — just pleasantly so. However, take care whenever handling hot peppers. Do not touch your fingers to your eyes or other soft membrane and wash your hands and cutting board when done. Types of peppers purchased Saturday at Reading Terminal Market. Pictured above beginning at the bottom center is a dark, moderately hot poblano. 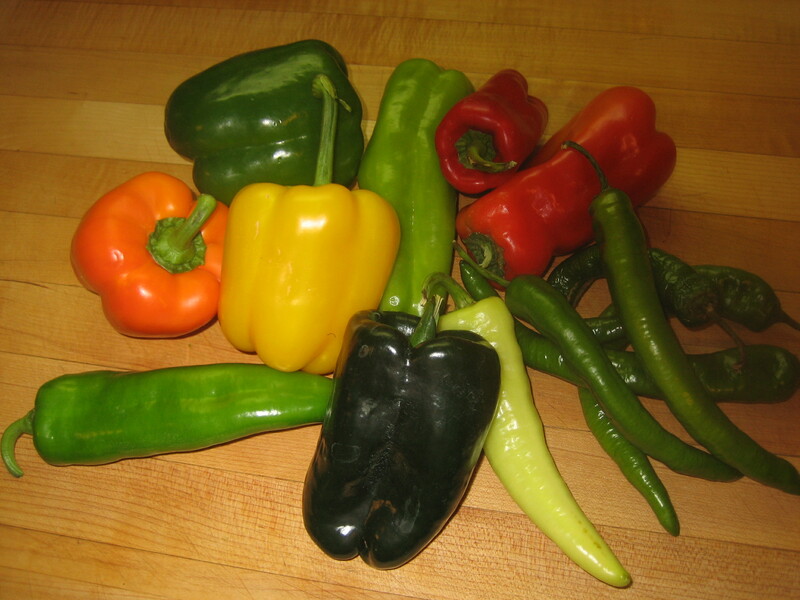 To the left and running clockwise: a moderately hot Anaheim, orange and yellow sweet peppers, a green bell pepper, assorted mild frying peppers, long hots and a moderately hot banana pepper. Roasting whole peppers over intense heat chars the skin — softening it and/or enabling you to peel your peppers, while the peppers also get cooked from the inside by the steam that builds up. The simplest way to roast peppers is on an outdoor grill with ample space to roast all in one batch. 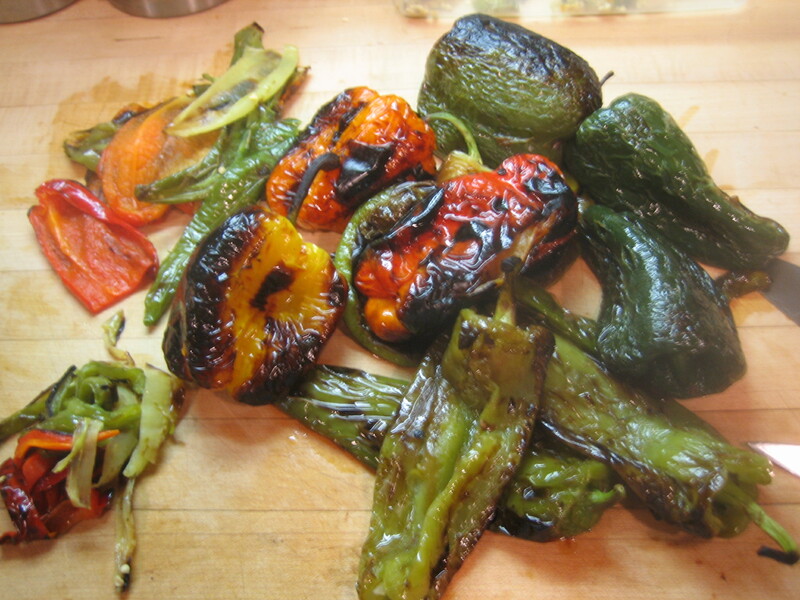 You can also roast peppers — one at a time — by placing directly on the cooking grate of a gas burner. This is an easy way to roast a single pepper. But if you are roasting the big batch and your grill is buried under two feet of snow, then the broiler method works best. Pre-heat broiler to high. Begin by very lightly rubbing each pepper with olive oil. 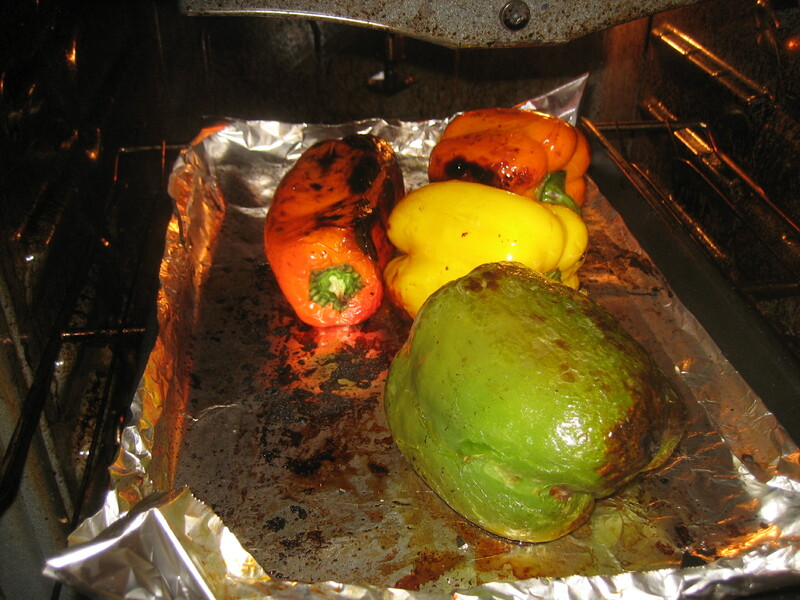 Place peppers on a sturdy rimmed baking sheet and place on upper oven shelf, but not so high that peppers touch broiler. As peppers broil, blister and darken, rotate peppers to cook all over. Kitchen tongs is the ideal implement to do this because you do not want to poke a hole in the pepper and release the steam. Firm and meaty sweet peppers take to charring and peeling. Thinner skinned peppers just need a light charring — mostly blistering to soften the skin as you will not peel these. 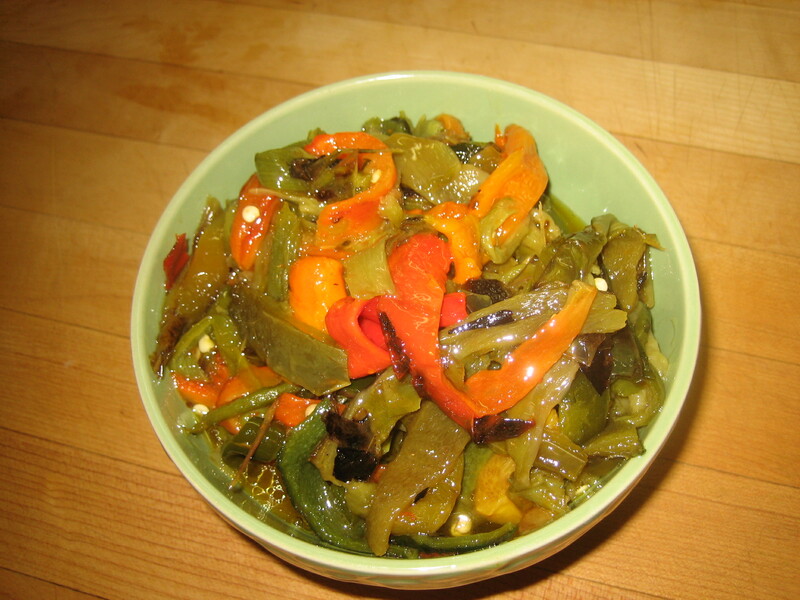 Remove peppers from broiler, place in bowl. When cool enough to handle, cut away or pull away stem. Split peppers in half with skin side down. Gently scrape away and discard seeds by scraping gently with a paring knife. While doing this it is helpful to keep your scraping area clean of seeds with a dough scraper, damp cloth or knife blade as the seeds will adhere back on to just cleaned peppers and you will have to scrape them off again. Be patient. Ready for removing stems, splitting, scraping away seeds and cutting into strips — julienne. Once seeds are scraped away, remove black char from peppers. Not every bit needs to be removed. Next, make small stacks of peppers and cut into julienne strips. Very long strips should be cut in half. Place pepper julienne in bowl. 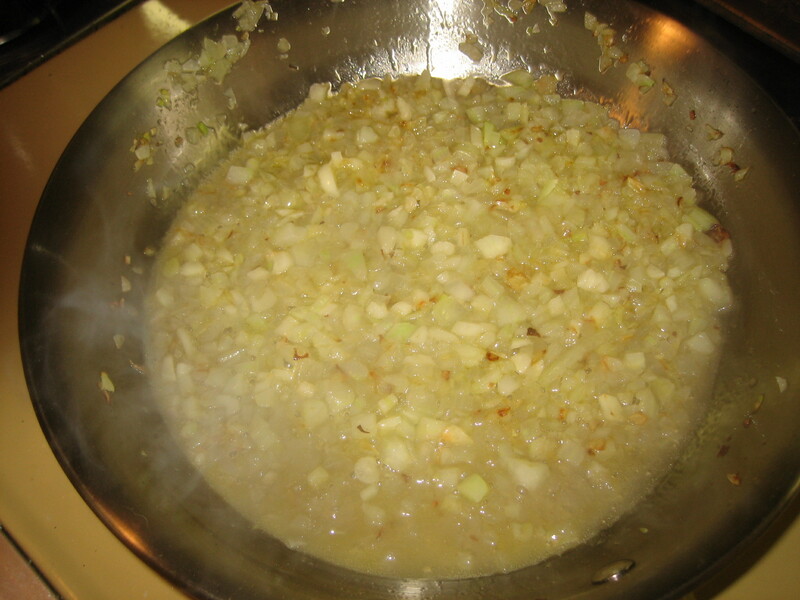 Add lots of chopped garlic — about a teaspoon of chopped garlic for every pepper, good olive oil, salt and pepper. I also like to add some cracked toasted coriander seeds, but strictly optional. In selecting peppers, pick a nice holiday mix of lots of sweet red and orange peppers with green peppers — ideally more red than I selected above. Roasted peppers will keep in the refrigerator through the entire holiday season. At Home’s seven Sections are organized from hello to good-bye beginning with Section 1: Welcoming Guests. And there are few better ways to welcome holiday guests than with a “house cocktail” such as my Pomegranate-Lemon Martini. It is one of four Four Seasons of Martinis included in At Home. Typically, martinis are made one at a time in a shaker with ice, which serves the function of diluting the alcohol a bit. But you don’t want to be bothered making drinks for each guest when you have a big group. Below, we’ve given you recipes for cocktails that can be made in a pitcher ahead, using water to dilute the alcohol instead of the traditional ice. do ahead Martinis can be made up to one day ahead and chilled until serving. In a pitcher, combine vodka and all other liquids. Stir. Chill for at least 3 hours before serving. Pour martinis into glasses and garnish each one with recommended garnish. These martinis go down very easily. As with serving any alcohol, as host you have the responsibility to make sure your guests do not drink and drive. If you have any concerns or a driving guest seems impaired, stop drinks early and extend the evening. Do not let an impaired guest drive. At Home: A Caterer’s Guide to Cooking & Entertaining is an ideal house gift throughout the holiday season and for the host of a New Year’s gathering. Online ordering is easy. A word of caution: Serve this special ice cream treat one Christmas and folks will want it from you every Christmas. It’s the gift that you’ll have to keep on giving. Crushed candy canes provide a festive look and crunch to the ice cream. Garnish your sundaes with miniature candy canes stuck into the ice cream, hooked ends up. The ice cream is very rich, so keep servings small. do ahead Ice cream can be made up to two weeks ahead. Sauce can be made up to a week ahead and refrigerated. Microwave briefly to loosen before serving. 1 In a mixing bowl, combine egg yolks, sugar and salt. Whisk until pale and creamy, about 1 minute. Stir in peppermint extract. 2 In a small saucepan, combine heavy cream and half and half over moderate heat and simmer until nearly boiling. Remove immediately from heat. 3 Add cream mixture in a slow, steady stream to yolk-sugar mixture, using a whisk to stir continuously. Transfer combined base mixture to a large measuring cup and reserve the bowl for the following step. 4 Slowly pour base mixture back into the pot over low heat. Stir constantly until lightly thickened. Do not boil. If using a thermometer, bring to 170º, about 10-12 minutes. Otherwise, heat until the mixture coats the back of a spoon. To check, put spoon in mixture, remove and run your finger down the back of spoon. It should leave a distinct, clean line for a moment. Remove from heat at once and pour into the reserved bowl to stop cooking. 5 Chill custard completely, at least 4 hours and up to overnight. 6 Freeze ice cream in an ice cream maker according to the manufacturer’s instructions. Once it is ready, turn frozen mixture into a bowl and fold in 1 cup crushed candy canes. Place in freezer for at least 4 hours for final freezing. 7 Top ice cream with chocolate sauce and remaining crushed candy canes.